3 JULY 2012 | LONDON – As part of the London Summit on Family Planning on 11 July 2012, The Partnership for Maternal, Newborn & Child Health (PMNCH) in collaboration with the Innovation Working Group (IWG) and the United Nations Foundation have organized a parallel session to launch a new guide for businesses that identifies investment opportunities for improved women’s and children’s health. 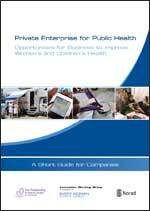 The Private Enterprise for Public Health guide highlights the potential that can be unleashed when businesses leverage their core areas of expertise, not only to generate profit, but also to identify and create opportunities for improving the health needs of women and children. Through illustrative examples, the guide identifies companies in various industries that are creating both business and social value (shared value) through innovative and transformational business models in developing and emerging economies where they can have the greatest impact. The session on 11 July will include an interactive and panel discussion on: (1) The untapped role of the private sector in accelerating the achievement of health related MDGs, and (2) How leading businesses from different industries have been and can contribute to improving women’s and children’s health (inclusive of family planning services) through focused investments, shared value, and collective impact. This document highlights a broad range of specific and practical opportunities for improving the health of women and children while also generating value for private enterprise. We call this “shared value”. It provides information about the health needs of women and children in developing and emerging economies to help companies identify where they can have the greatest impact. Private Enterprise for Public Health aspires to catalyse a collective approach to creating transformative partnerships to help to save the lives of 16 million women and children. These partnerships need to be sustainable and scalable and include a broad range of stakeholders to make lasting progress. While this document provides practical opportunities for private enterprises to engage in improving women’s and children’s health, we expect the business community to behave responsibly and to respect human rights in general (and women’s and children’s rights in particular). We also expect private enterprises to uphold the principles of preventing harm and actively safeguarding women’s and children’s interests within their own operations in the marketplace and the community (a list of relevant principles is listed in the references section). This guide originated in collaboration with the Innovation Working Group (IWG) in support of Every Woman Every Child. The Partnership for Maternal, Newborn & Child Health (PMNCH), which hosts the secretariat of IWG, developed this guide with social impact consultants FSG, in collaboration with the World Health Organization (WHO) and the United Nations Foundation (UNF), supported by the Norwegian Agency for Development Cooperation (Norad).